Steven Pearlstein, columnist for the Washington Post, says he never meant to disparage TheStreet's editorial standards in his Sept. 27 column examining TheStreet's Northwest Bio coverage. On Sept. 27, the Washington Post published a column by Steven Pearlstein, a Pulitzer Prize winner, attacking the integrity of TheStreet's biotech coverage and its reporter, Adam Feuerstein. The article, entitled Northwest Biotherapeutics Stock Woes Highlight the Harm of Short Sales, examined the participation of short-sellers in biotech. 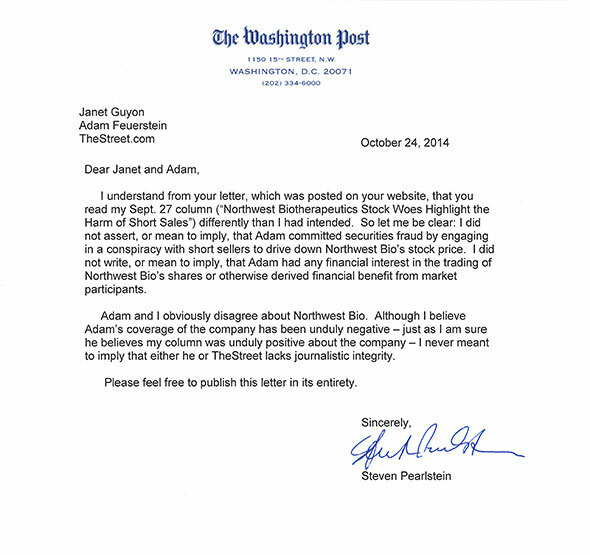 TheStreet disputed Pearlstein's assessment of our coverage of Northwest Bio and wrote to the Post's editor, requesting a retraction: TheStreet Seeks Retraction From Washington Post on Steven Pearlstein Column. The Columbia Journalism Review (The Washington Post short-sells a reporter's integrity) and the Los Angeles Times (Taking aim at short-sellers, but misfiring) also published articles critical of the Post's column.